Full disclosure: This is a book review of The Day the Angels Fell. 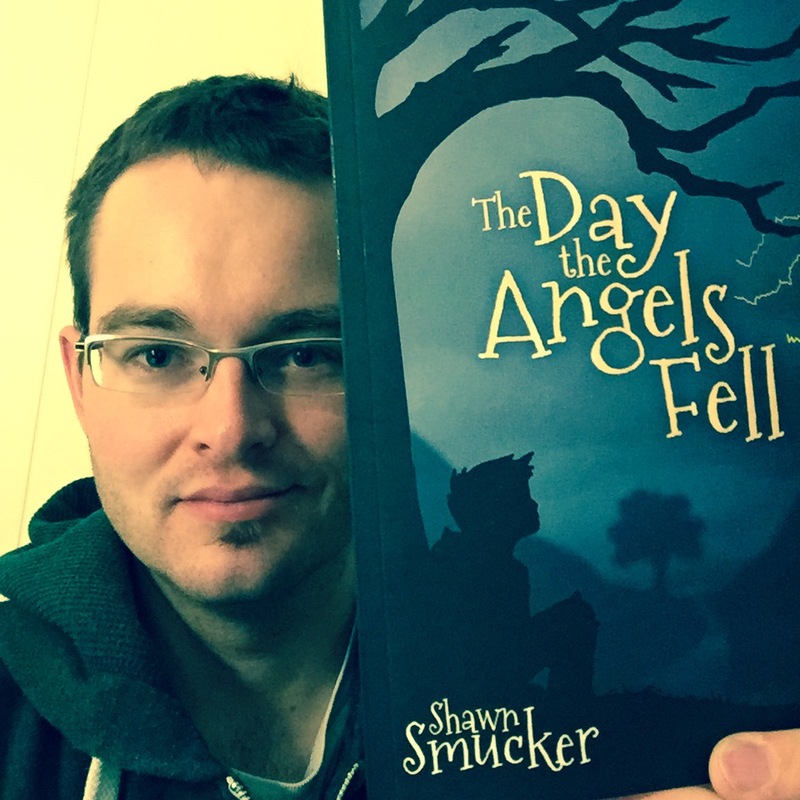 The author, Shawn Smucker, is my good friend. We’ve shared a number of early morning breakfasts and a couple kayaking trips. Shawn is a better person than I am. He’s kinder and more courageous than I’ll ever be. But that’s not entirely why I’m reviewing (and yes, promoting) Shawn’s book. I read Shawn’s book and I’m promoting it because I’m genuinely interested in its subject matter and I value its death message. The Day the Angels Fell is a novel that explores an alternative narrative about death … a narrative that we rarely think about in America. The common narrative that we’ve been told is that death is THE enemy. That death is so horrible we should do everything we can to shield ourselves (and especially our children) from its specter. That our mortality should be hidden away so that the rest of us don’t have to think about it. The Day the Angels Fell explores the idea that death can be a gift. And not only does it explore that alternative narrative, but it does so with the intended audience being children (middle school on up to adult). On some levels, The Day the Angels Fell compares with C.S. Lewis’ popular The Lion, the Witch and the Wardrobe. That book – more so than the other Narnia tales – provides a way to help children understand and tackle big ideas like betrayal, sacrifice and forgiveness. The Day the Angels Fell tackles the big idea of death through a fantasy narrative that’s intended for children, but – like The Lion, the Witch and the Wardrobe – still resonates with adults. It’s hard to talk to our children about death (hell, it’s hard to talk to adults about death). It’s even harder to do so without using flowery euphemisms and warm fuzzy answers. Perhaps the best way to do it is through a really good story. Shawn’s a storyteller (he’s written well over five books), and in this story, he finds a way to tell an alternative narrative about death for children and adults that isn’t wrapped in overused clichés. 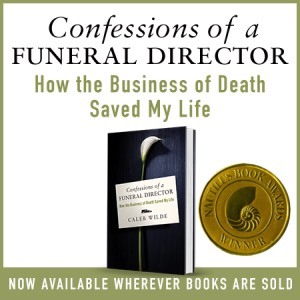 Right now Shawn dropped the Kindle edition price to $3.99 just for our Confessions of a Funeral Director community. It’s well worth the price of the purchase and the time to read it. You can find the paperback version HERE. 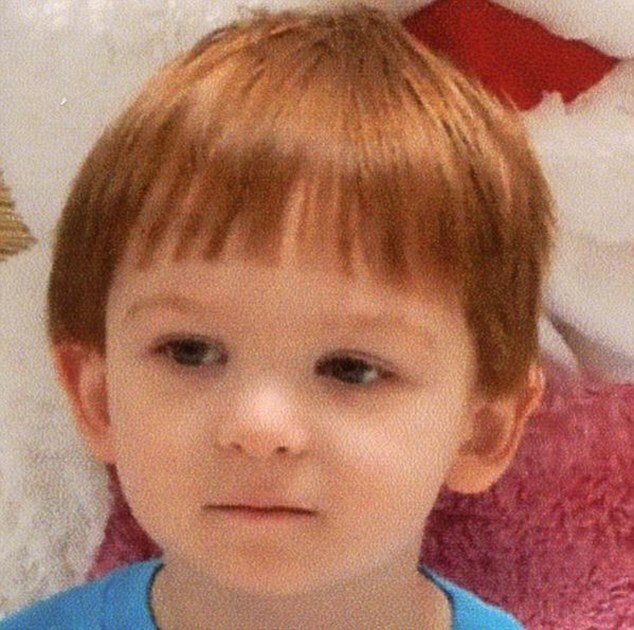 A couple miles from my home on Tuesday, November 4, 2014, three-year-old Scotty McMillan was found unresponsive in his home, the victim of abuse and torture from the hands of his mother and his mother’s boyfriend. Hogan said professionals with deep experience in these types of cases were brought to tears. “Our ER nurses see a lot of terrible things. But when they saw his body, they wept,” Hogan said. Scotty’s death has shocked our quiet little countryside. As the father of two-year-old Jeremiah, I haven’t been able to read our daily newspaper’s more detailed descriptions of Scotty’s abuse. The idea of two full-grown adults abusing the small, defenseless body of a three year old …. My Jeremiah is so full of innocence, so full of wonder, trust and love, such actions committed against someone his age (or any age) have literally made my stomach turn in disgust. Over the last couple days, as we’ve attempted to process this story with family and friends, my emotions have gone from extreme anger towards Scotty’s “parents” to extreme sadness as I’ve imagined the pain Scotty must have felt in his final days. As a way to protect myself, I’ve tried my best to ignore this story. I don’t want to think about it. I don’t want to imagine it. I don’t want to believe a mother could commit such actions. But I can’t ignore it. Instead of directing my emotions in anger and hatred, I’ve decided my wife and I will make promises to our Jeremiah as a way of honoring Scotty’s short and brutal life. This is the only positive way I can cope. This is the best I can do. You will never fear our hand or our touch. You will never cower in fear of our anger. You will never see us as monsters. We will protect you from the monsters. We promise to be your light, not your darkness. We promise to use our strength in gentleness. We promise our bodies will never harm yours. We promise to teach you to love others, by loving you. We, your mom and dad, will hold each other accountable. We won’t be proud. We won’t be arrogant. We will seek outside help, because you — our child — deserve our best. Peace will be found in our embrace. Freedom will be found in our love. Security will be found in our home. Confidence in our love will be found in your heart. This home is a place of peace. This home is a place of rest. This home is a place of patience. This home is a place of growth. Dear one, the world is full of trouble and pain. But trouble and pain will not be found in this home. The world is full of violence and abuse. But violence and abuse will NEVER be found in this home. When my son was killed at 17 years old, I knew I would visit his grave a few times a week for the rest of my life. This was an obligation. Not visiting him would be tantamount to neglect. These were my son’s bones, all that was left of him on the earth. Someone had to visit and remember, and it was my responsibility. I haven’t been in almost a year. He died almost 4 years ago. The first several times I went, there was no headstone yet. I am a Navy veteran and Alex, as my minor child, was entitled to be buried in a national cemetery. I went and looked at the fresh dirt with orange plastic netting on it, to prevent the ground from eroding. I looked at the printed card and metal stake. It was winter. I sat or sprawled on the grave for hours at a time, until my hands turned blue with cold. We had an unusually snowy winter. I sobbed and tried to bargain with God to take me instead. As you can see, that didn’t work out for me. People came over and asked me if they could call someone, and if I was ok. I must have been quite a spectacle if strangers were that concerned about a woman crying over a fresh grave. I wanted to say: No, I am not ok. You are a well-meaning but stupid human. Get away from me. Can’t you see I am trying to mourn my kid, or freeze myself to death? Instead, I said “Thank you, I am fine “. Then it became spring and I showed up several times a week to watch the plugs of grass spread across the hole. The netting was taken away at some point. The stone was set, and I spent hours tracing his name with my fingers, and punching myself in the leg as hard as I could to distract myself from the psychic agony I felt. The first time I saw his name (and mine) on that headstone, I screamed and fell to my knees. It was so much more permanent than the card and the stake. The US Government had provided a monument that said he was dead forever. It was lined up with thousands of stones exactly like it. There was an empty space next to his grave, for my husband Paul, an Army veteran. I would be buried on top of my baby. My name and pertinent dates will be carved into the reverse of his stone. Our various atoms will perhaps eventually mingle again, as when I carried his body inside of mine. His bones are in the company of heroes. The national cemetery will be perfectly maintained for as long as the US Government exists. There are literally hundreds of deer, completely unafraid of humans. They walk among the monuments peacefully. They also eat the flower arrangements. Alex would enjoy that. Six months passed. I found myself dreading each visit. They spread further and further apart. I became completely hysterical and inconsolable during and after each visit. I was guilty for not going as often as i should. I became mildly suicidal every single time i visited. There was no winning this one. My Father-in-law was diagnosed with terminal cancer when Alex had been dead for 10 months. He was dead a month later. He mentioned that it was too bad that he couldn’t be buried next to Alex, his much-loved Grandson. I am the nurse in the family, so i took care of him. He died at home, with us. Naturally, when he died we gave him my husband’s spot. Paul will be buried with his father, a decorated Purple Heart and Bronze Star Vietnam Veteran. I will be buried with our son. We have created a family plot in the middle of a National Cemetery. Alex’s grave was disturbed when they buried his grandfather. This caused me to be unable to leave my bed for weeks. The grass took some time to grow back, and it became my habit to lay in the dirt and/or mud between them, with one hand on each grave. This winter wasn’t as snowy, but it was wet. If I was mildly suicidal before, now I was in great danger of ending my own life. I started only going on holidays, birthdays, and death days. This made me less suicidal, but more guilty. I felt like I was failing to properly honor my son. I still do, but I cannot take the emotional tornado caused by seeing my baby’s name on a headstone twice a week. I was dying inside a little more each time I visited. I have the florist deliver flowers to the graves occasionally. Other family members visit sometimes, and I know the cemetery is cared for. I can do nothing else. I have nothing left to give. I feel like the custom of visiting graves is barbaric, at least for grieving parents. There is nothing under that stone but a decomposing body. In this case, the body of the child who was NEVER supposed to die before me. The body that died and completely invalidated my life, The body I didn’t protect well enough. Because that’s really what the problem is. No matter how many times you tell a grieving parent that their child’s death was not their fault, they will never believe you. Somehow, in their own minds, they are to blame. My son was killed when he was hit by a 9 ton tow truck, operated by a distracted driver. I was 40 miles away. I blame myself. So visit if it comforts you. Do not visit if it tortures you. Your kid doesn’t care. Either the Atheists are right and he knows nothing about it, or he is in Heaven and way too busy partying it up with God to notice worldly stuff. This awesome story is written by Tumblr user Annie and was originally posted on her Tumblr page. I messaged Annie and asked if I could share her story here and she agreed. As some of you know, my brother died last year. It was actually 8 months ago today. Anyways, when my mom and I went to Hollywood Studios yesterday, we decided to stop and take pictures with Woody and Buzz in my younger brother’s honor. We were the only people in line without little kids and got strange looks, but stayed anyway. When it was our turn for pics, both Buzz and Woody were very fun and playful and posed for pictures. At the end, though, my mom started to tear up, followed by me tearing up. My mom quietly explained to Woody that her son had passed away in October and that he loved Woody growing up, that Toy Story was his favorite movie as a kid, and he had worn his Woody costume almost every day when he was little after he got it for Halloween. My mom just said a quiet thank you and stepped back so that the next people in line could take a pic, but before she could get away, Woody pulled her into the tightest, sweetest hug. Buzz engulfed me in a hug, having heard what my mom said. I’m not exaggerating that Woody hugged my mom for a solid minute as she cried on his shoulder and everyone just got quiet and let us have our moment. The cast member that had my phone took pictures and then started to tear up himself. 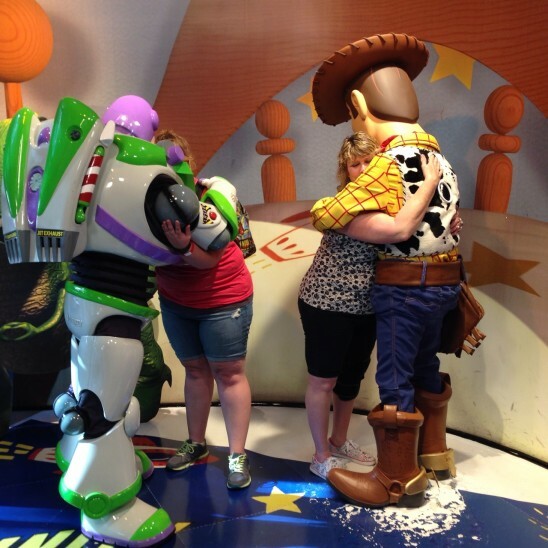 Woody finally let go of my mom just to pull me into a tight hug and Buzz hugged my mom. While the character actors aren’t allowed to talk, they made a kissing sound to blow us each a kiss while they hugged us and I could hear Woody sniffing through the costume. We walked away feeling bad for taking up so much time, but the cast members just smiled and told us they were glad we could have that moment. As we walked away, Woody and Buzz waved by and blew more kisses. My mom turned to me, with tears still streaming down her face, and said that it was the best hug she had been given by anyone since my brother had died. And that, ladies and gentlemen, is the magic of Disney.